I hate to admit it, but sometimes I can be really negative. Especially with Threenager behavior. It's so easy to focus on all the limit pushing, the whining, the back and forth of demands, having their lunch dismissed even though its exactly what they asked for, refusing to get dressed, completely ignoring simple directions... see? So easy to focus on that stuff and not focus on the good stuff. But I find, when I focus on the good stuff, Judah starts to seek out that positive attention. One trick I've started to combat this is the "Rainbow Berry Jar." I started this jar idea in December. Judah was having an uptick in naughty behavior and Elfie, his Elf on the Shelf took off back to the North Pole leaving a jar, a bag of snow balls (cotton balls from my medicine cabinet) and a note telling him that if he could fill up the jar with snow balls for every nice thing he did, then she would come back. And it worked! Before long, he was cleaning up messes and doling out kisses without being asked! We kept the Snowball Jar up throughout the winter and the positive results kept on coming and also to help me stay focused on praise. I've suggested this idea to multiple friends and all have had similar positive results. It's super simple: find a jar and some pom poms. 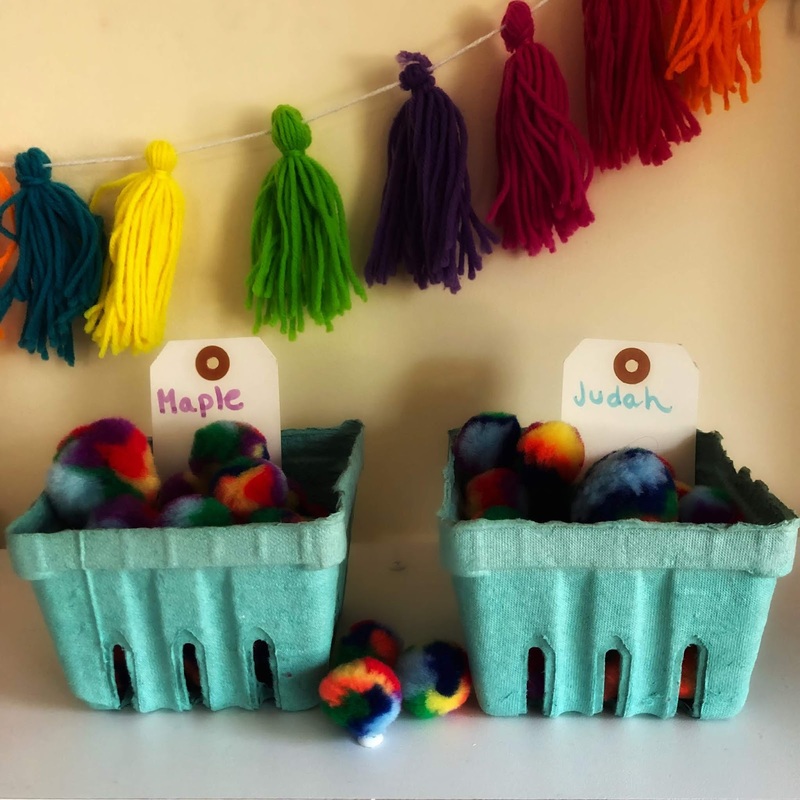 Explain to your toddler that every time they do something good like follow a rule, clean up a mess, share with their sibling or whatever behavior you're looking for or would like to combat and they'll get a pom pom. You can even let them pick the color pom pom and name them, which is how we ended up with Rainbow Berries. (It was also a fun trip to the craft store in the middle of the winter when we were running out of ways to entertain ourselves.) Once the jar is full, they get a reward! We mostly do small little toys, but you could also do fun excursions. If there's a toy that Judah has been asking for, sometimes we'll tell him that he can earn it next time he fills his jar. He's been begging for a donut or an ice cream, that's another thing he can earn. I'm not quite sure how many berries we have, but it works out that he fills his jar every 1-2 weeks. He was filling it up like crazy at one point, so we made it a little harder to earn them. You'll find your own pace. But I would recommend making it kind of easy the first time so they get a taste of success! We're about to start doing two jars now that Maple is a little older. We're also hoping that her love for cleaning up after herself will inspire Judah when he sees all the Rainbow Berries that she's earning! But if your kids bicker or fight a lot, a combined jar is a great idea to help the work together. 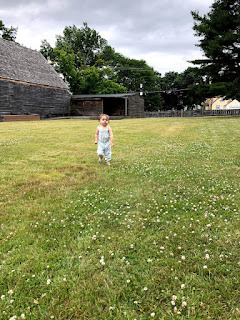 At one point, we tried taking a few Rainbow Berries away if Judah did something particularly out of line like hitting or making a giant mess and refusing to clean it up (I've never met anyone who loves to make messes more than this kid). But this made it almost impossible for him to fill and it felt less gentle than we aim to be. So we talked with him about it and told him we wouldn't do that anymore. A good deed is a good deed and we wouldn't take that away. Here is a link for some similar Pom Poms and a similar jar. We just upcycled some berry baskets from a recent berry picking adventure for their new set up. Here are some of the more popular prizes that Judah has earned! The boy loves little animal toys that move. Little Live Lady Bugs - He somehow hasn't even lost their tiny babies. Chubby Puppies - Judah's first Chubby Puppy had to be disassembled while attached to his gorgeous curls. He now is very responsible with them. Good luck, friends! Anybody else have any Threenager tips?